FILE - This is a April 27, 2017, photo of George Soros, Founder and Chairman of the Open Society Foundation, as he waits for the start of a meeting at EU headquarters in Brussels. George Soros' Open Society Foundation said on Monday it would cease operations in Turkey, days after President Recep Tayyip Erdogan accused the billionaire philanthropist of trying to divide and destroy nations. 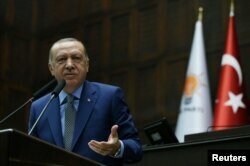 "The person [Kavala] who financed terrorists during the Gezi incidents is already in prison," Erdogan told a meeting of local administrators Wednesday. "And who is behind him? The famous Hungarian Jew Soros. This is a man who assigns people to divide nations and shatter them. He has so much money and he spends it this way." One of the 13 people detained on Nov. 16 was Hakin Altinay, who helped establish the Open Society Foundation in Turkey. Others were staff members of Kavala's Anadolu Kultur center, which campaigns for human rights and cultural diversity. Kavala, in detention for more than a year, said on Monday in a statement posted on his website that he was still waiting for an indictment to be prepared so he could prove that claims that he had helped to direct and finance the Gezi protests and wanted to overthrow the government were "unfounded." Soros, a U.S.-based financier and philanthropist, and his Open Society Foundation have also come under fire in Hungary.